UPDATE V1.5 14/01/2013 Author Submit File Plugin now has the ability to have allowed file extensions added in the settings page due to popular demand. 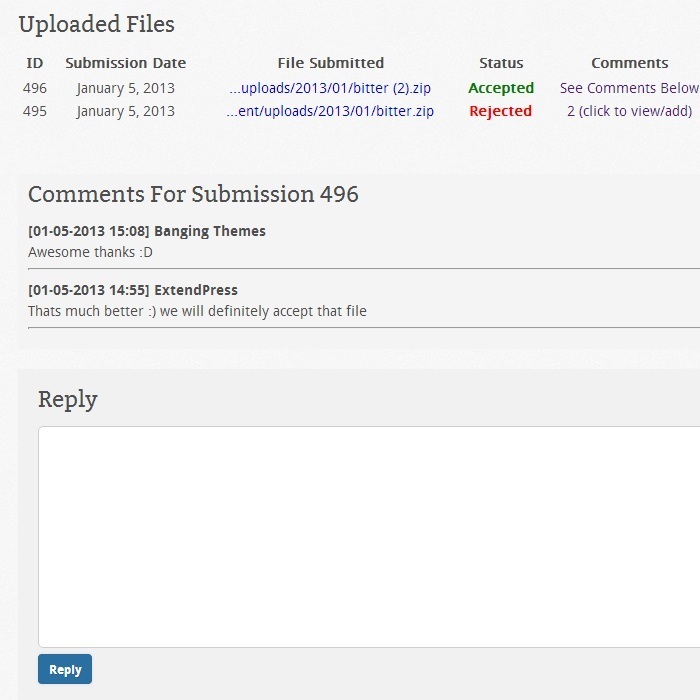 The Author Submit File WordPress plugin makes it easy to add a user file upload section to your WordPress website. With just 2 shortcodes added to a page you can have a dedicated section for users/authors to submit all sorts of files (ZIP’ed up) for you to review. WARNING! If viewing live preview by following the button above, be sure to click “Remove Frame” in the top black bar as it seems to mess about with the demo sites logging in. Once a file has been submitted you are able to download it and then accept it or reject it as well as communicate with the uploader all within wp-admin. The documentation included with this plugin walks you through the installation and set up in detail. 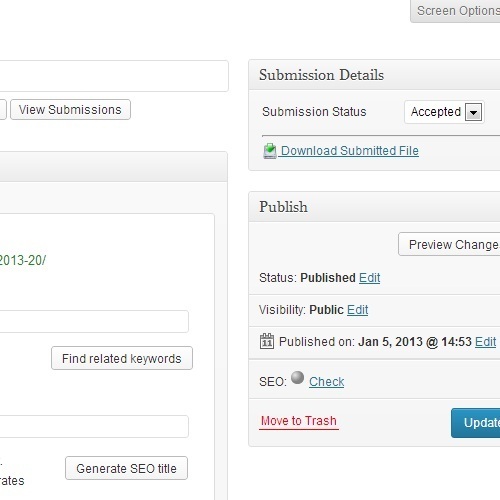 Most of the work is handled within the plugin itself, all you have to do is create a page and add 2 shortcodes to set up your file submission page. 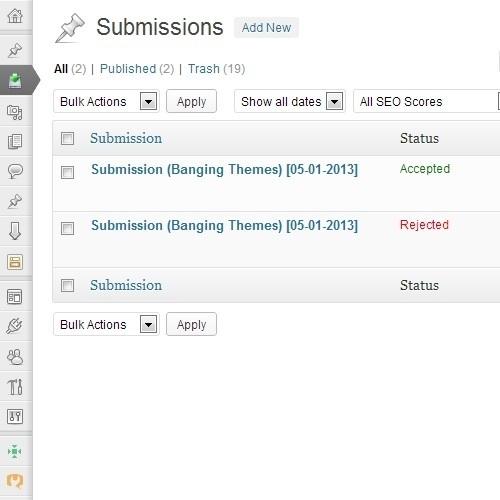 A new post type is created in your wp-admin menu showing you the previous submissions with there status. 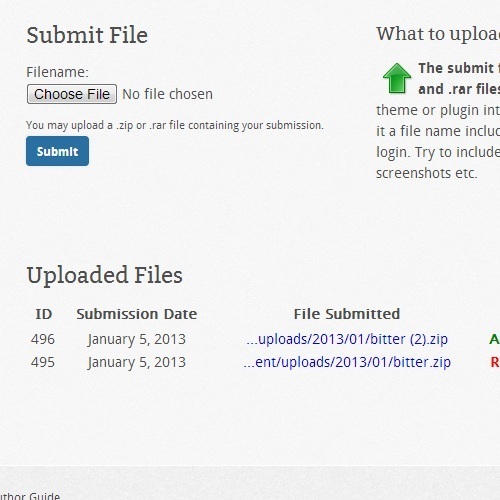 Going into a Submission will allow you to change its status, view the file and even communicate with the uploader. In the plugin settings you can assign an email address to be notified when a user submits a file on your WordPress website if you wish. 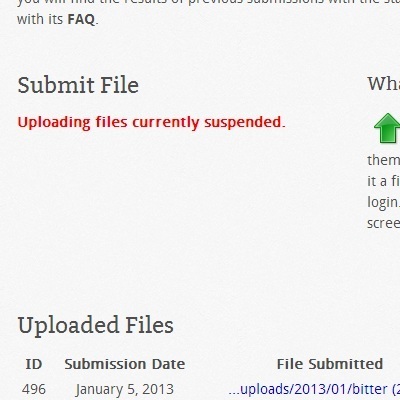 Users are notified when you change the status of there submitted file.